We like to be active participants in our sport, and TrekCo and Deers Leap have always had a bit of a connection with the south-west of the USA. We have organised hiking, climbing and biking trips there for staff and the region is an amazing adventure playground. This winter I undertook what is now a regular mountain biking trip to southern California and Arizona, sometimes taking in Utah, in December and January. The weather in this period is almost always 90% sunny and quite warm – around 18-20C in general. Sometimes it will rain for half a day and snow at higher elevations, but this gives the great excuse for a guilt-free rest day! It’s impossible and can be very dangerous to bike in the desert in the rain in any event; the landscape isn’t designed for runoff and water just rushes across the ground filling creek beds in a flash. I took my recently acquired Trek Fuel EX9, discovering the delights of upsizing to 27.5″ wheels. Taking your bike abroad has several pros and cons. First, it’s a pain to carry to the airport which mustn’t be underestimated. You have to get a lift to the airport, and in the US it can be a little awkward mounting the car rental shuttle bus – but not too bad. Virgin Atlantic is a good airline for taking bikes as sporting goods – a major factor and it’s why I fly with them every time. However, they used to be free with Virgin and now cost £65 each way for the extra bag, worth noting. The bike needs to be 23kg max, but that means I can still get several kilos of bike gear in the bag with the Fuel EX9. And the more recent models are even lighter (buy yours at Deers Leap Bikes!). Renting a bike is oddly almost impossible in most places in the south-west US except for major mountain bike centres. You can rent easily in Moab (I’ve used the beyond excellent Poison Spider), but most southern Californian bike shops will look at you as if you’re an idiot if you ask to hire a bike (except beach cruisers near the coast). All of this reduces the bike size and is obvious as you go along. I use a bike bag, not a box – this decision will depend on a) what type of vehicle you have in the USA and b) weight. A normal car won’t take a bike box, so I use the bag and put the bike on the back seat or in the boot. A regular ‘Full size’ car in US rental locations will take a bike that way, but a box/carrier won’t fit in either way. So of course if using a box you won’t need all the packing steps above. If this seems like a fuss, it’s nothing compared to getting a damaged bike on arrival and having to visit the local bike shop and wait for a repair! One year I was convinced I couldn’t remove the rear mech and just padded it out – it sticks out most and suffers a lot of leverage and was destroyed on arrival. $150 and two days later..
As for what tools to take, the obvious and the minimum. Multi tool, a tube or two, tyre levers etc. The only large item I take is a light pedal spanner – this is the only thing awkward to replace and although you’ll only use it twice, again it saves a trip to the local bike shop. Advice about desert biking – really, although a great deal of stress is placed on this, there’s not much complicated to it. – take loads of water, obviously. – you will be told that you will get endless punctures from cacti. This in my opinion is greatly exaggerated. I have hardly ever had any punctures in more than a dozen biking trips to the south-western US – maybe just lucky, but I just can’t see it. However it’s clearly wise to take a couple of tubes. – falling off can be extremely painful so take your time. If you fall into a cactus, you won’t be thinking how quaint and unusual it is – it hurts a lot. And the ground is hard and unforgiving, no grassy landings here! Rocks and cacti everywhere. – in the warmer seasons you might see snakes and so on; these are rare in the middle of winter. Read up on it for each area you visit, but basically look ahead and stop if you see anything move. Be careful where you sit down for lunch. – it is far, far easier to get lost in the desert than you think. Take your time with maps, junctions and so on. I am a professional mountaineer and get lost constantly. Maybe it’s just me, but some areas are extremely confusing. Others are really well signposted. -err.that’s it. Read the guidebooks but it isn’t complicated, just dry. One you’re set up and on the road, where to go? There are tons of websites recommending trails – try Mountain Bike Bill Sonoran Desert Mountain Bicyclists The Mountain Bike Project and loads of others you’ll stumble across. There is a great book for Arizona – Arizona Fat Tire. You can find it on Amazon here (no I don’t get commission!). This book is really informative with great maps and valuable info – don’t be fooled by the very American style. Orange County – plenty of singletrack areas in the area’s parks down by the coast – big canyons that go inland into the mountains with very long track networks and some challenging singletrack. Palm Springs – surprising, but just west of Palm Springs is a range of mountains with plenty of wilderness. There’s the Pines to Palms trail and some superb desert biking here – don’t drive past thinking it’s just a resort! Southern Desert – try Anza Borrego and Cuyamaca Rancho – again, loads around here. Clearly there is a ton of biking in SoCal and I wouldn’t even begin to address it here – just trying to give an idea of some of the areas I’ve experienced. Moab – where to start? You could write a whole book about mountain biking in Moab and not finish. Moab is known as the world centre of mountain biking for good reason – it’s amazing. The world famous Slickrock Trail is just behind the town dump, and that’s just for starters! Moab is really cold in the winter months though; it’s possible to ride there but check out the weather forecast and in particular the webcams. When it snows in Moab there’s not a great deal of snow but it covers the trails so it’s impossible to see where you are going,and doesn’t melt for a while. So avoid for several days at least after snow, or below about 5C. The picture on the right is Adam, Deers Leap shop manager, on the Porcupine Rim Trail – surely one of the world’s classic days out on a bike. Moab is one of the few places where you can rent a bike easily – there are several bike shops in town, and the standard bike would be a good full-suspension bike for around $50-75 a day. This could save a lot of travel hassles. Don’t forget the brakes are the other way round! The area around Hurricane has loads of bike trails and is also the location of the Red Bull Rampage if you want to have a go – this isn’t the easiest place to find and there are actually a couple of locations for old and new sites, but once you are in the right spot the trails and jumps are easy to see. Arizona has many areas for biking which are outlined in the guide. I haven’t biked around Flagstaff which is a big area, but there are many recommendations for the other areas. Sedona – this allegedly ‘alternative’ town is a magnet for all sorts of alternative therapies, shops selling crystals and so on, but to European eyes is extremely manufactured and fake. However it is set in a beautiful location and surrounded by stunning scenery which is perfect for biking. It has become another big mountain biking centre as a result. I was first attracted to it by stumbling across the YouTube video ‘Something in Sedona’ – and the biking is pretty much like that. Loads of manufactured trails just south of town, and cross country all over the place. A must. Prescott – like many American towns, the local council as well as clubs and action groups have really put tons of effort into identifying, making and mapping trails. There is a lot around here from the famous Granite Basin trails to Thumb Butte and plenty of other areas. Prescott is a really nice old town with a very laid back and friendly atmosphere. It’s 5000 feet above sea level, so is colder than Phoenix, but I have found it is usually around 10-15C in winter so perfect for riding. Tuscon – is a big place, with desert and mountains all around so the riding is plentiful and accessible. There are a couple of great areas right on the edge of town like the Sweetwater Preserves and Fantasy Island, and if you go out into the several ranges of mountains nearby there are longer cross-country trails like the classic Bug Springs. 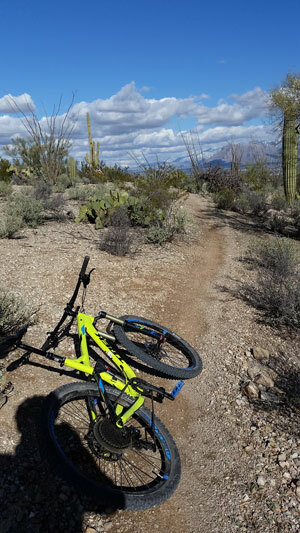 Classic desert cactus and perfect trail surfaces – packed gravel which is just great to ride. It hardly ever rains in winter, so there is loads to explore here. Phoenix – a much bigger city and there is a good deal of biking, but not quite so many areas with such a natural feel. The parks near town have some good desert riding including the famous South Mountain – although I greatly preferred White Tank and my favourite is McDowell Mountain Park. This is not very technical but has a beautiful flowing track and the scenery is lovely; a very friendly place. There is a competition track here (‘Competitive Loop’) too, which is OK but again not really technical. Even for me.